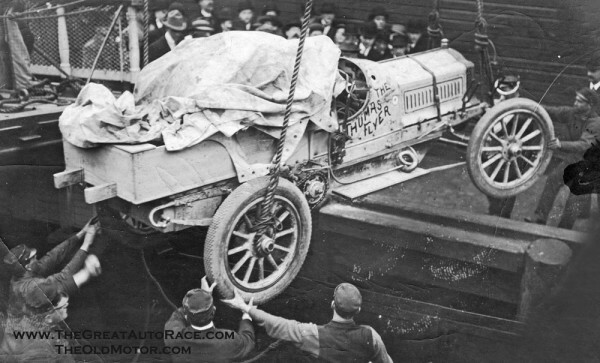 Previous parts of this series describe the events leading up to the Around-the-World Racer’s arrival in San Francisco. The story of their epic effort continues here. The problem now facing the Flyer team was deciding what supplies that Schuster had managed to muster while crossing the United States would be essential for rest of the journey around the world. With only 15% of the distance to Paris covered in the U.S. leg, logistics became a real challenge. Even basic things like food, fuel, and shelter might become deciding factors in the eventual outcome of the race. To maintain their lead over the competition and insure there would still be solid ice across the frozen Bering Strait (as a means of getting to Asia), they could waste no time getting to Alaska. The first order of business was to make whatever repairs to the car that were necessary in San Francisco. Work began replacing the countershaft housing, springs and transmission. New wheels and drive chains were also installed. The Thomas was then delivered to the pier for the voyage to Seattle aboard the City of Pueblo. New York Times reporter George MacAdam was waiting at the dock in with his suitcase in one hand and a crate of carrier pigeons in the other when they arrived in Seattle on March 29,1908. He replaced T. Walter Williams who had earlier quit the team and returned to New York. The birds would be used to communicate from the Santa Clara as they steamed north up the Inside Passage to Valdez. Such Yankee ingenuity was often exhibited by the Flyer crew. The voyage up to Alaska gave George an opportunity to read journalist Luigi Barzini Senior’s recently published book,“Peking to Paris in a Motor Car. Barzini was covering the race for the Italian newspaper Corriere della Sera, and had accompanied Italian Prince Scipione Borghese, the winner of the Peking to Paris race . He also studied a 20 page New York Times memorandum about motoring in Alaska. According to the report, the snow would be deep, but there would be a frozen crust on top that might support an automobile. When the Flyer and her crew arrived at the pier in Valdez on April 8, the entire population of the town and a brass band were waiting to greet them. Without much more than the New York Times report to go by, Schuster asked to speak with the owner of the Valdez-Fairbanks mail stage in order to get a better idea of the conditions he might encounter on the next part of the journey. His name was Dan Kennedy, a longtime resident of Valdez who knew the trail well. After looking at the Flyer, Kennedy remarked, “It’s the first automobile I have ever seen. I’ve been in Alaska nearly twenty years, but I don’t know what your automobile can do.” Kennedy then took Schuster up the Valdez-Fairbanks trail in a horse drawn sleigh. After nearly sinking out of sight in the deep snow, they transferred to a dog sled. Beyond that, Dan explained the Yukon River froze not smooth like a pond, but in chunks of upended ice. 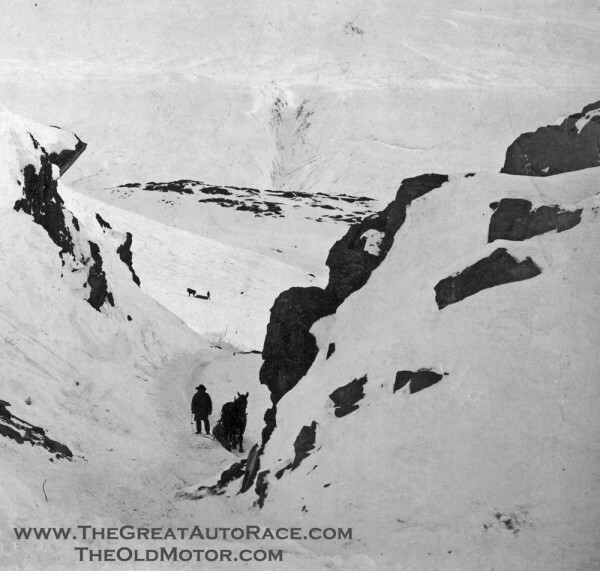 With over 1,200 miles of these conditions, Shuster devised a plan to get the Flyer to Nome. He would disassemble the 5,000+ pound Thomas into pieces that weighed no more than 600 pounds (the capacity of a dog sled), mush it across Alaska and then reassemble the pieces on the frozen tundra of Siberia before driving on to Paris. The cost was an astronomical $10,000 just to freight the Flyer to Fairbanks! Fortunately for the Americans, the only race team to reach Alaska, the New York Race Committee had changed the route. Everyone would now use ships to cross the Pacific. On April 9, the Flyer returned to Seattle aboard the Bertha. 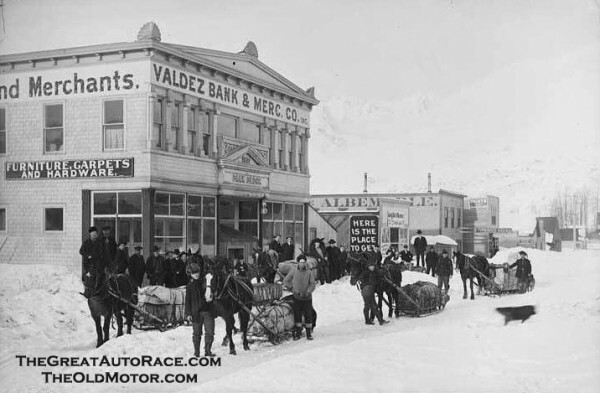 To this day, you still can’t drive a car from Valdez to Nome. 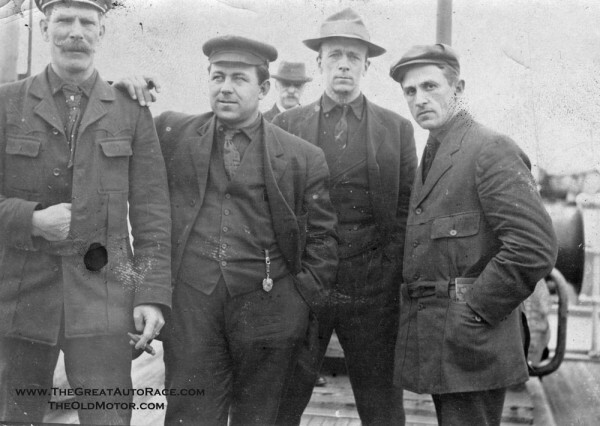 Upon arrival in Seattle on April 16, it was discovered that the Italian Zust and French DeDion teams had already sailed for Japan on April 14. The severely damaged German Protos had been shipped from Idaho to Seattle by rail car in violation of the rules. They were later penalized 15 days for having done so. On April 21, the Thomas was loaded aboard the S.S. Shawmut, bound for Kobe. During the crossing, Schuster went down into the cargo hold to inspect the Flyer. He had previously removed the metal fenders and replaced them with leather aprons to reduce weight. Before loading the Thomas on board, the aprons had been removed to prevent damage and were placed under a tarp. When George lifted the trap, the leather fenders were gone! He immediately went to the ship’s Captain who reluctantly explained that his Chinese crew had taken the leather to make new sandals. The Captain quickly ordered the Ship’s carpenter to make new fenders from wood and canvas. Click to view previous Parts 1-6 and Part 8. 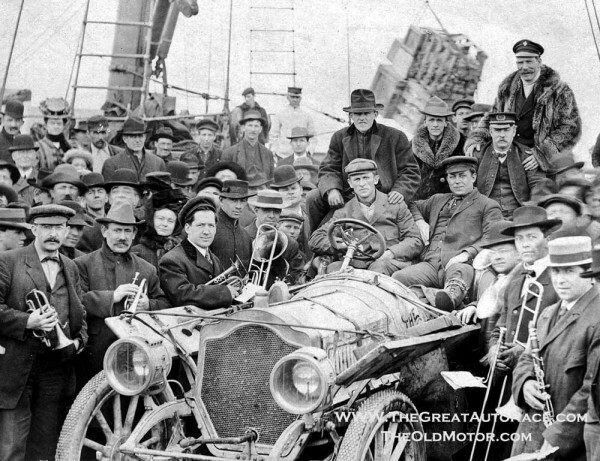 This entry was posted in Auto photos 1885 - 1920, Auto Racing 1894 - 1942, New York to Paris Race and tagged Bering Strait, carrier pigeons, City of Pueblo ship, French DeDion teams, George MacAdam, German Protos, Italian Zust, New York to Paris Race, Peking to Paris in a Motor Car, S.S. Shawmut, Seattle, the ship Bertha, The ship Santa Clara, Thomas-Flyer, Valdez, Valdez-Fairbanks trail.